When you need gutter installation and gutter guard services, protect yourself and your home with a call to Huff ‘N Puff, the leader in gutter care for the Capital Region and Hudson Valley. We have served more than 35,000 customers over our 40-year history, so you can be confident you are dealing with a trustworthy and experienced company. Our factory-trained team will install your Gutter Helmet® system with our exclusive 5-Star installation service. Here’s what to expect when you choose America’s #1 gutter guard! Scheduling.When you contact Huff ‘N Puff, a specialist will make arrangements to visit your home at a time that is convenient for you. You do not need to clean your gutters prior to this appointment. We want to check all existing issues and problems with your gutters before presenting you with a quote. On-site visit. Our factory-trained specialist will begin by carefully examining your roofline, gutters, and soffit and fascia boards for any issues that could interfere with the installation and proper performance of Gutter Helmet. Education.Your specialist will take time to educate you on how Gutter Helmet works and how the system will affect your gutters and home. Estimate.After the inspection is complete, you will receive a free, detailed written estimate for the installation of Gutter Helmet. You are under no obligation to purchase and you will not be pressured to make an immediate decision. 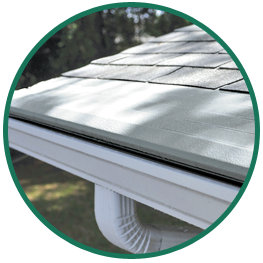 Peace of mind.Enjoy the convenience and peace of mind of complete gutter protection for your home. With Gutter Helmet, you’ll never have to clean your gutters again! Avoid the hassles of leaks, clogs, water damage, insect infestations and more when you choose gutter services from Huff ‘N Puff. Request a no-obligation online price quote request for gutter installation and gutter protection, or contact us today at (855) 483-3678.